For the last month and a half, tensions in the Eastern Mediterranean have escalated due to unilateral moves from Greek Cyprus, which has been commissioning Western energy companies to explore hydrocarbon resources in the Eastern Mediterranean in an area it declared its exclusive economic zone (EEZ). However, Ankara's reactions and measures in the area have prevented these moves since it consider them to be a violation of the sovereign rights of Turkish Cyprus. President Recep Tayyip Erdoğan reiterated Turkey's determination to continue protecting its and Turkish Cyprus's rights to natural resources in the region at a ceremony in Ankara Tuesday. Speaking during an inauguration ceremony to launch natural gas services for 101 districts at the Presidential Palace complex in Ankara, Erdoğan said that Turkey's recent stance regarding offshore drilling activities off Cyprus "had hopefully been instructive for some who saw an opportunity to start unilateral moves in the region when Turkey is engaged in anti-terrorism operations elsewhere." All steps in the waters surrounding Cyprus should be taken through the participation of both Turkish and Greek parties, including investments and the share of discovered resources, Erdoğan said. "Turkish and Greek Cyprus should form a joint committee for drilling activities and both sides should get their fair share of the island's natural resources based on their populations," the president said. He further reiterated Turkey's resolution to protect its and Turkish Cyprus's rights in the Eastern Mediterranean, especially in terms of hydrocarbons. he also announced that Turkey's first drilling vessel, which has the most cutting-edge technology in its field of operation with a width of 36 meters and a weight of 51 gross tons, will soon depart to start drilling operations in the Eastern Mediterranean. The island of Cyprus has been divided since 1974, when a Greek Cypriot coup took place after decades of violence against the island's Turkish community and Ankara's intervention as a guarantor power. It has seen an on-and-off peace process in recent years, including the latest initiative in Switzerland under the auspices of guarantor countries Turkey, Greece and the U.K. that collapsed in 2017. 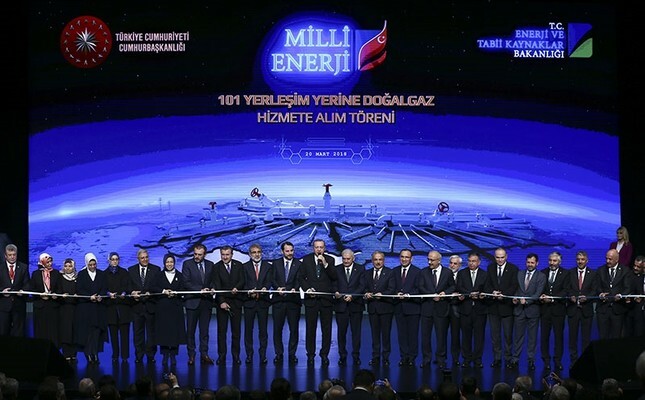 In order to decrease its dependency on external resources and to meet rising energy demand as a result of steady economic growth, Turkey has been carrying out energy investments and projects and diversifying its resources. Over the past 15 years, energy investments have reached TL 172 billion ($43.8 billion) and public investments totaled TL 41.3 billion. Investments in natural gas distribution was TL 11.2 billion. Erdoğan said that Turkey aims to reduce its energy dependency, and the construction of the Akkuyu Nuclear Power Plant, the country's first, will begin this year. "President [Vladimir] Putin and I will jointly participate in the groundbreaking ceremony," Erdoğan said, explaining that they also spoke about it during a phone call to congratulate Putin's on his re-election in Russia on Monday. Erdoğan and Putin are expected to meet in Turkey in the first week of April. The two leaders will chair the seventh meeting of the Turkish-Russian High-Level Cooperation Council. Later, the two presidents will reportedly lay the foundation for the Akkuyu Nuclear Power Plant, which will cost an estimated $20 billion. The first unit of the Akkuyu Nuclear Power Plant, which will have four reactors, will be launched in 2023, while the other units will be commissioned one by one in the following years. Accordingly, the plant will reach full capacity in 2026. With four reactors, each with an installed capacity of 200 megawatts, the plant will generate an average of 35 billion kilowatt hours of electricity annually when it reaches 4,800 megawatts. Another nuclear power plant project is currently underway in Turkey's Black Sea province of Sinop, and the project is run by a French-Japanese consortium. The Sinop nuclear power plant will have a 4,480-megawatt capacity. Turkey's energy imports amount to roughly $55 billion annually and its energy demand is among the fastest-growing in Europe. Ankara aims for at least 10 percent of its power generation to come from nuclear energy in less than a decade to cut dependency on natural gas.